Pregnant women, drunk people and "those who are sleep deprived" should not watch 3-D television because of potential health issues, electronics manufacturer Samsung says on its Web site. The company also says people at risk for stroke or epileptic seizures should consult a medical professional before watching TV in three dimensions. Samsung and Panasonic began selling the first 3-D TVs in the U.S. last month. 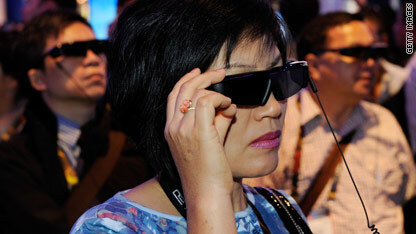 The warnings come as other TV manufacturers are set to debut 3-D home entertainment systems this year. When watching 3-D TV, users wear special glasses with lenses that open and close rapidly to produce an image that appears to leap off of the screen. "Viewing 3D television may also cause motion sickness, perceptual after effects, disorientation, eye strain and decreased postural stability," the Web site message says. "It is recommended that users take frequent breaks to lessen the potential of these effects. If your eyes show signs of fatigue or dryness or if you have any of the above symptoms, immediately discontinue use of this device and do not resume using it for at least thirty minutes after the symptoms have subsided." The TV maker also says wearing its 3-D glasses in normal situations, when you're not watching 3-D TV, "may be physically harmful to you and may weaken your eyesight." "Viewing in 3-D may cause disorientation for some viewers," the warning says. "Accordingly, DO NOT place your TV television near open stairwells, cables, balconies, or other objects that can be tripped over, run into, knocked down, broken or fallen over." Before we went to the theatre to see Avatar, my partner and I talked about the possible (short-term) effects of watching 3-D especially on IMAX. We remembered watching one of the first IMAX movies that included scenes of flying in a glider. Many people in the audience suffered from temporary vertigo and nausea. The effects are similar to travel-sickness. Some of us are more sensitive than others. Geez, event the onslaught of visual stimiuation in today's movie threatres can cause the same feeling. I digress, but I became very ill (but temporarily) after riding on the tea-cup ride in Disney World – I was temporarily blind and ended up with a massive headache. My point is that some of us can tolerate having our senses challenged to an extreme; others cannot. This time, it was my partner who had to leave the threatre because he became ill – sweats, palpatations, and overall queaziness. There was a happy ending. He was finally able to watch Avatar today – in the comfort of our own home and without the 3D. America and the world for as that matters. We were born to die, but why rush it because of human greed. Yes, there are a lot of things in this world today that causes a lot of dieases these days. However, we must realize that when we accept what they feed us, we have open the door for them (Large Cooporation) and the good old boys to continue to use the human race as their lab. Remember, there is a big issue about health care when will it stop. Young people, you have a voice, do not be duked. I am from the 60's as they call us the baby boom generation. We took a stand. If you all do not take a stand for something, you will stand for anything. I guess I'm not getting one, I alway watch tv at the top of my stairs while drunk and sleep deprved! Pre-2010 "Samsung 3D" Tv owners. Pre-2010 Samsung "3D Tv" can not accept the latest 3D format. Samsung has abandoned their loyal consumers. Samsungs -" 3D ready" Tv's purchased pre-2010 are not capable of receiving the latest 3D formats even though samsung has advertized that their 3D ready Tv's would be future proof . "Samsung DLP HDTVs are capable of displaying future 3D games, movies, and other programing via 3D compatible glasses and hardware"
Good for MITSUBISHI they also sold the "3D ready" sets. Samsung has left the "3D ready" Tv owners in the dust with nothing! Take action... add your name to my list ! Building a list of pre-2010 3D ready Samsung Tv owners. Samsung should follow the the example of MITSUBISHI and develop their own 3D adapter for their loyal consumers to buy. Or at least pay MITSUBISHU and have them remove the block that Mitsubishi added to there adapters. "Viewing 3D television may also cause motion sickness, perceptual after effects, disorientation, eye strain and decreased postural stability,"